PHILADELPHIA, Pennsylvania (August 3, 2017) – Peggy Gionta, president of IT consulting company, Partner’s Consulting, hosted a Career Exploration and Leadership Camp on Thursday, in conjunction with Girls Inc. 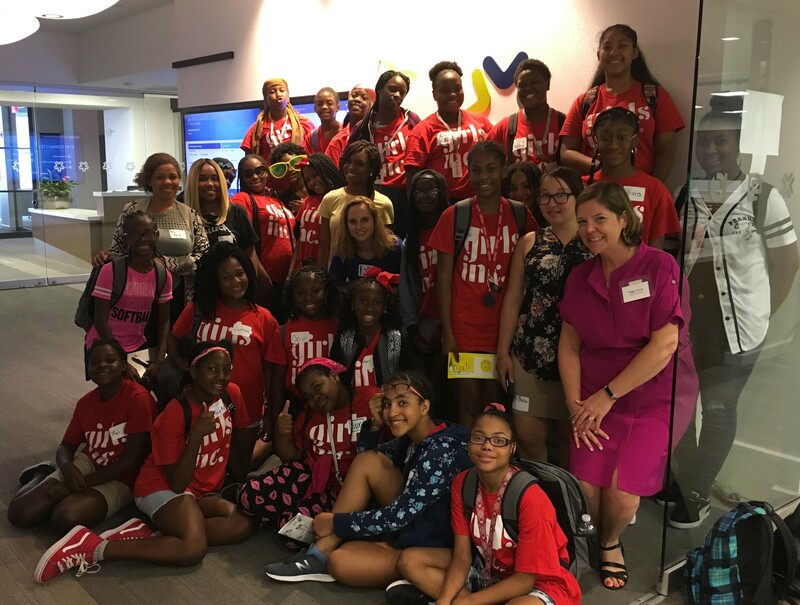 Through a partnership with Women in Cable Telecommunication’s (WICT) Philadelphia chapter, twenty-seven girls ages 11-14 had a chance to participate in a week-long series that connected them with professional mentors in the fields of media and technology. Tina Lee, Senior Director, Business Services Implementation OPMO at Comcast, led an inspirational discussion about the importance of diversity and bringing new points of view and opinions as a woman in a male-dominated industry. Heather King, also from Comcast, spoke about her role as Senior Director of Program Management, and urged the girls to try and find ways to incorporate fun into both their personal life and work life. Grace Gair, Director, Enterprise Security Architect at Radian, led an interactive and lively discussion in which she mapped out her career path, describing it as “not a ‘typical’ path to IT,” but one in which she was able to learn and become proficient over time. “Every day I go in and do my job it gets easier. The more you do, the more you learn and the easier it gets. It’s about being confident,” she said. The day was capped off with the girls working in groups to present a business idea and social media hashtag to a Shark Tank-style panel. Each girl in the group had a role to perform- CEO, Project Manager, Product Design and Marketing/ Sales. Among the business venture ideas were an eye scanner security company, and a military clothing design company that would donate 15% of its sales to veterans who can’t find jobs. “Our goal for the day was to encourage the girls and help them feel confident that their ideas, goals and dreams are valuable and worthwhile! We also wanted to provide info about women’s careers in STEM from several positive female role models, and give the girls positive feedback in the Shark Tank project to help them dream big!” said Ms. Gionta. Girls Incorporated® is a nonprofit organization that inspires all girls to be strong, smart, and bold. With roots dating to 1864 and national status since 1945, Girls Inc. has responded to the changing needs of girls through research-based programs and public education efforts that empower girls to understand, value, and assert their rights. Girls Inc. serves over 140,000 girls annually through 82 affiliates. WICT’s mission is to create women leaders who transform the Cable Telecommunications industry. For nearly 40 years, WICT has partnered with cable and technology companies to help build a more robust pipeline of women leaders. Founded in 1979, and now over 10,000 members strong, WICT is the largest and oldest professional association serving women in cable media.